Mayor Bowser set a goal of closing the troubled large homeless shelter in the old DC General Hospital, because it was a substandard facility and poorly managed. The City Council voted to close the facility. Attention brought to the issue by the death of Relisha Rudd pushed the city to act. 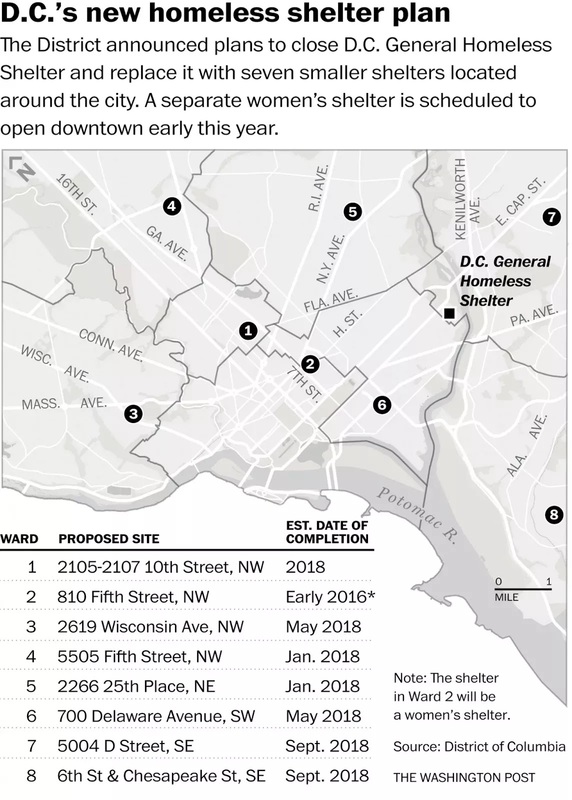 This Washington Post lists the locations for the network of homeless shelters that will be created in DC to replace the large facility at the former DC General Hospital. The response is to deconcentrate (make the facilities smaller) and distribute-decentalize homeless shelter services, across the city, outlined in the Homeward DC Plan. 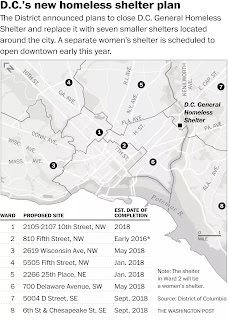 Yesterday's announcement of the program lists the location of new facilities to be opened or constructed, with one in each ward ("District mayor reveals sites proposed for homeless shelters across city," Washington Post). Homelessness as a river not a lake. But an element of the problem that too often is overlooked is that because of the nature of the problem, homelessness is dynamic--the group of people needing services continues to grow even if you have provided permanent housing to everyone homeless at any one time. So it's not really solvable in that somehow it can be permanently eradicated. I liken it conceptually to a river--the water continually flows down the river from the high point to the low point and the water is constantly replenished--rather than a lake--where the water present is more or less static ("standing water"). The temporary homeless due to economic circumstances. One of the problems dealing with the homeless issue is that the nature of the problem varies. There is so to speak a temporary group of people who have economic problems--in the 1980s and 1990s research found that this group hated being in shelters so much that they did almost anything necessary to get out of the homeless shelter system. Is economics-related homeless moving from a temporary to a permanent condition. 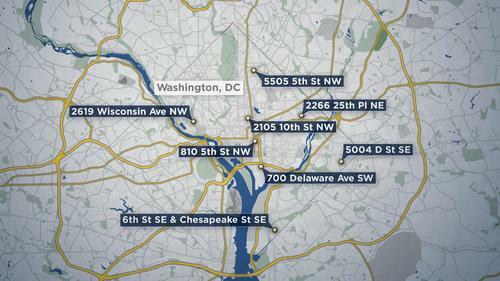 However, in high cost real estate markets like DC, it's more likely that this segment may become larger and more permanent in response to the rising cost of housing (although it is the case that people with substance abuse and/or mental health conditions are likely to have diminished economic circumstances as well). Single room occupancy housing as a type. One example is how with the elimination of single room occupancy housing as a prevalent type, people have more limited options ("Disappearance of SRO hotels playing even larger role in San Diego's homelessness problem," Los Angeles Times; "What happens when housing for the poor is remodeled as luxury studios," Washington Post). Perhaps DC needs to consider the creation of a set of SRO housing facilities as part of the program to address homelessness, although a number of such facilities exist currently. I imagine the demand is much greater than the supply ("Restored Rosslyn Hotel annex will house 75 homeless," LAT). Plus, it appears as if the housing offered is part of transitional housing programs to get the homeless off the street, rather than a type of housing routinely offered as part of the city's housing mix. In any case, providing SRO housing is only one element of an in-depth approach and framework. Permanently homeless due to substance abuse and mental health problems. The other segment is comprised of people who are permanently homeless, mostly as a result of chronic conditions revolving around substance abuse and/or mental health issues. Housing first as a way save money. With regard to the this group, the response over the past 20 years has been to provide permanent housing even if the people refuse services ("Million-Dollar Murray," New Yorker), because otherwise the cost to "service" the population is extraordinary (e.g., "Los Angeles County spends $1 billion managing homelessness," Los Angeles Times). Many cities have adopted this approach as a cost-containment matter, because the most frequent users of the emergency care system (911) rack up hundreds of thousands of dollars of services annually (see the San Diego Union-Tribune series "Health Care 911": "Part 1: The Problem;" "Part 2: The Streets," "Part 3: The ER;" "Part 4: A New Model;" "Part 5: Breaking the Cycle" and a follow up, "Paramedic team redirects most-frequent 911 users"). San Diego's Project 25 initiative focused on providing housing and services to the 25 people using the emergency care system the most. In San Diego, frequent users generate over 11% of emergency medical calls. The main issue: providing high quality management and services and itinerant vs. structured facilities. In my experience having once lived around the corner from a homeless shelter, is that there is a big difference between homeless shelters that are itinerant or "temporary"--when the people can't stay in the facility during the day and are forced out with their belongings, often hanging out in the adjacent neighborhood and other places, until they return again at night--and permanent/ongoing, such as those that are part of drug rehabilitation programs, which are structured and have services, assigned rooms, lockers for personal items, etc. With itinerant facilities, there are big problems offloaded to the neighborhoods around the shelter. With structured and managed programs, by comparison, the problems are minimal. Ironically, the Coalition for the Homeless managed the facility around the corner from where I lived after it became a structured facility, and except for an occasional ambulance and car washing fundraising events, it was pretty unobtrusive, other than being in a big old school building, but they are the same group that managed homeless shelter services at DC General when Relisha Rudd died ("Relisha Rudd's legacy: Millions to help the homeless," Washington Post). The challenge for the city will be to provide high quality management and services at these facilities, which because they will be spread out across the city, won't be "warehoused" in a more remote location, like DC General at Reservation 13 on the edge of Capitol Hill and off to the side by a cemetery, where problems went unnoticed by a wider population and were allowed to fester. By distributing these facilities around the city, in each ward, they will be highly visible and involved residents (most resident organizing on local land use issues focuses on maintaining and enhancing property values) will oppose them vociferously if they aren't well-functioning. 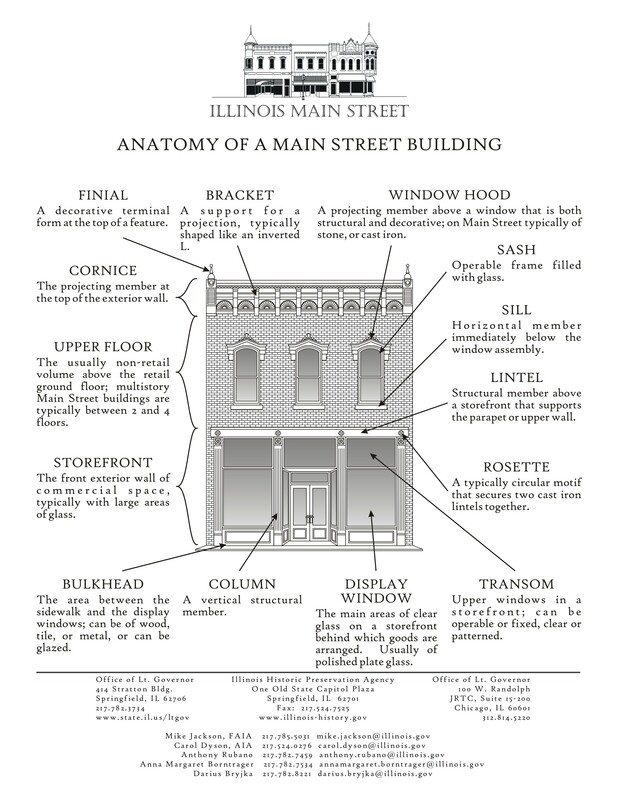 Great point on the structured vs. itinerant. zero confidence in the ability of the DC government to do that correctly. yes. I just wrote it more politely. I met someone who has decades of planning experience and is one of the people running the Promise Neighborhoods program. She seems like a great person, but didn't have a structured approach to the problem, was very much focused on individual successes within the neighborhoods and coming up with systematic frameworks for dealing with the issue wasn't on her radar. That being said "the academics" tasked with researching the outcomes for the program have pretty formulaic approaches too. Will cogitate some on the Gates thing. Not sure what I think about Urban Institute. I can't claim to have read all their reports. Some conclusions from some projects seem reasonable. Across the board... ? fwiw, W3 figures they provide support to the rest of the city because of the demographics of the student body at Wilson High School and the frequent problems with students in and around the Tenleytown Metro Station. FWIW, Coolidge High School doesn't seem to present similar problems vis a vis Takoma Metro, and Roosevelt High School doesn't present similar problems vis a vis Petworth Metro. Fortunately for those of us in W4. wow it's been awhile since I've remembered the debacle of Boys Town. As a person from a troubled childhood, I have no problem with such programs. Or even one in W6. The problem then was it was proposed as an under-dense use at a transit station, when transit stations are optimized with denser development, especially in DC, even though that station is on the edge of the core. Plus, it needs to be more "public-engaged use" rather than private cloistered separated use, like a youth assistance program. Similarly, I am not sure how I feel about the senior housing building by the 7th St. Metro Station in Shaw. One it's not very dense. And two, while I understand the value of being located at transit, the reality is that the people don't go out much and so uses that require a high degree of connectivity should be preferenced. That being said a "mixed vertical use' approach in a single building could integrate senior housing as a portion of the total mix of housing in a taller building. Something I forgot to comment on in the entry is (1) it's incredibly disrespectful of the public to make an announcement of this on Monday (2) and then schedule the public meetings to discuss this for three days later and (3) to hold them all at the same time for every ward simultaneously.